If I’ve already got in your face about this on Facebook, sorry. I’m just very excited. 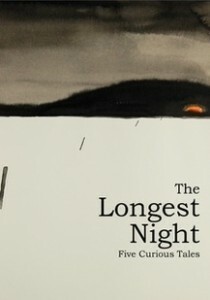 Today is the official publication day for The Longest Night: Five Curious Tales which is a writing/art/lo-fi DIY publishing collaboration I’ve been working on since August with my friends Richard Hirst, Emma Jane Unsworth, Alison Moore, Tom Fletcher and Beth Ward. Richard and I have been friends for donkeys years and have always shared a love of ghost stories, the gothic and horror genres. He introduced me to The Wicker Man and The Evil Dead. We’ve been busily reading M.R James and Robert Aickman since we were teenagers. We’re also the world’s two biggest fans of Christmas. Ever. Why not, we thought, one sunny day in August, write a set of Christmas ghost stories, collaborate with a wonderful artist to have the beautifully illustrated then publish the book ourselves in a limited edition print run and sell it at a series of reading and performance events over December and January in the North West? Why not indeed. We could see no reason not to, so we did. We were even lucky enough to get one of our heroes – Stephen Volk – to write a wonderful introduction for us. Our first experience of Stephen’s work was watching Ghostwatch in 1992 – when most of us were ten or eleven years old and should have been in bed. Pipes! Stephen’s most recent work is the haunting novella Whitstable – a rare piece of work that manages to be utterly mesmerising, moving, and creepy as hell, too. The official website for the project is here – you can buy the book, read short extracts from the stories, book tickets for our reading events and admire samples of the artwork. The print-run is very limited edition and we’re currently sending out pre-orders, so if you want a copy, my advice to you is to bag one now. For the sake of your eternal soul, etc.